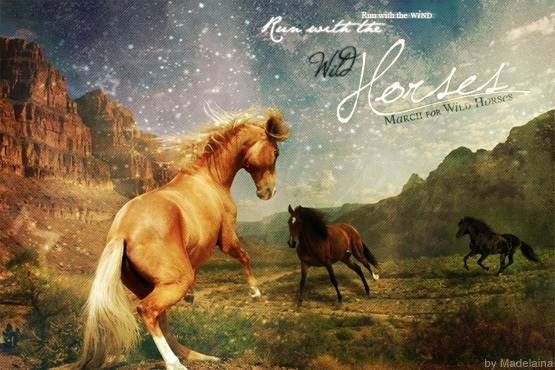 March for Wild Horses is an online event hosted by Girls Horse Club. The intent to use our collective, creative voice to speak out for the rights of wild horses on public lands, and show our support for the individuals and organizations who are their loving protectors. Each day throughout the month we’ll publish stories, essays, poems, and artwork created by horse girls, inspired by wild horses. Below is the timeline of activities leading up to and during March for Wild Horses, and answers to frequently asked questions. General Submissions – Fiction, non-fiction, and poetry about wild horses and feral horses. Please read the SUBMISSION GUIDE for information about what we look for when evaluating submissions for publication. International Horse Submissions – Write a story about an American Mustang “character” who represents the story of many horses taken off public land and held until they’re adopted, or worse. Writers are encouraged to research the history of wild horses in the US along with what’s happening now, then create a fictional character based on fact. Spoiler Alert: In this case, the horse’s story may have a happy ending (being adopted for the GHC stables), but there’s plenty of opportunity for conflict leading up to that. Artwork Submissions – We’ll also accept original artwork and photography for a wild horses exhibit in the Gallery. FEBRUARY 28th – Submissions close. MARCH 1st – March for Wild Horses begins. Each day throughout the month we’ll publish stories, essays, poems, and artwork. Comments will open on published submissions so everyone has a chance to voice their thoughts about wild horses. MARCH 31st – March for Wild Horses halts. If we write an Int*l (international) Horse story about an American Mustang, will the horse we write about be added to the GHC stables? Perhaps. The hope it to “adopt” a mustang for the GHC stables during March for Wild Horses. Int*l Horse submissions will be evaluated the same as any submission, and if suitable for GHC will be published in the blog along with other wild horse-themed stories and poetry. Depending on how many Int*l Horse stories we receive, the decision about how to select one for adoption will be made sometime during March.